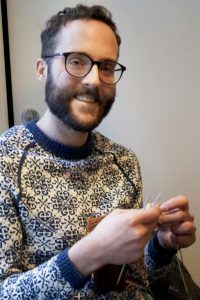 Birger Berge is a 29 year-old Norwegian knitter from Bergen. He became famous on Instagram with his knitting pictures, and his fame reached out of Norway. He talks to The Nordic Page about about his unique passion. We planned to meet Birger at a café in Norway’s coastal city, Bergen. When we stepped in the cafe, we found him sitting next to the window, already occupied with his knitting. It was not difficult to spot him with his needles, his decorated sweater reminding us his patterned Instagram page, followed by more than 17 000 people. Birger grew up in Naustdal, in the region of Sunnfjørd. It is at home he learned the knitting basics as a child, with his mum and his grandma. They knitted traditional garments, like Norwegian dresses, but mostly practical things to keep their farmers’ feet and hands warm in the winter. The Norwegian practical mind is never far off! They also never did complicated patterns on mittens since we will probably lose them on the next days! tells Birger. At the moment, he always wanted to do the same things they did: If they baked I wanted to bake, and when they knitted I wanted to knit too. It was very natural for me to do the same. It really became a passion for Birger when he began his studies in Bergen, as a way to reduce stress: I felt a bit bad if I didn’t read all the time. When I knitted, at least I did something concrete and I felt useful and nice, so I began to knit more and more. It was a really good way to relax and not feel guilty. Many researchers show it is a calming activity, which has a positive effect on your health. I think more people should experience it. In addition, it was very wet in Bergen, so it was nice to create garments I could wear to be warmer. Now, Birger is quite addicted to it: I take my knitting everyday with me, otherwise I would feel a bit naked. I think it became part of my identity. He knits during the lunch break, in the bus or even in the plane: In the airports, I always have to show it because I use metal needles and the security gates always make noise when it’s my turn. He tells us he could not watch TV without knitting anymore, or he would feel restless. While we are interviewing him, he just stops knitting to take a sip of coffee or explains his talk with gestures. Surprisingly, he seems even more concentrated on our discussion when his hands are occupied. He explains to us that once he has developed it, he could almost do it by nature: It’s like when you are advanced in piano: you can find the keys naturally and play them together. I admire everybody who makes knitting patterns, because I know how much work it is. It is also nice to see the individual’s expression behind it. For me, knitting is like art. When we discover all his creations on his Instagram page, we could wonder how he is able to procure so much yarn: he usually invents patterns and when he sells them two or three times, it covers the cost of a wool ball. But I’m not going to be rich from it at all! he reminds us. In fact, knitting is a hobby for Birger and his creations have a strong emotional value: I would not sell my garments like that, because you keep worrying about the things you made. I prefer to offer them to people I care about or to keep them for me. In all the cases, knitting is not paid enough! Birger takes the example of a sweater: If I work really fast, I can spend the whole week, every days and evenings, it is very time-consuming. It is a big process because you also have to draw the pattern, choose the yarn and do the calculation. It’s a lot of math! If you translate it in a normal working pay, it would be a very expensive sweater. Most people will not pay more than maybe 1000 kroner, which would be very low paid. People don’t really appreciate the work behind it. For Birger, the ultra-consumer society, reflected in the clothing industry, is to blame: We are so used to buy cheap clothes from Asia, wear them ten times maybe and don’t use them anymore. That’s also sad you don’t inherit clothes today. But you will if they have been homemade and more solid. Moreover, it’s more environmentally friendly if you hand down clothes through the generations. It’s better than the waste mentality in today society. Nonetheless, Birger feels people are more aware about environmental issues today and he thinks knitting is to be and remain popular in Norway. According to a 2016 survey from SIFO (the National Institute for Consumer Research), 43% of Norwegian women knit, for only 4% of men. 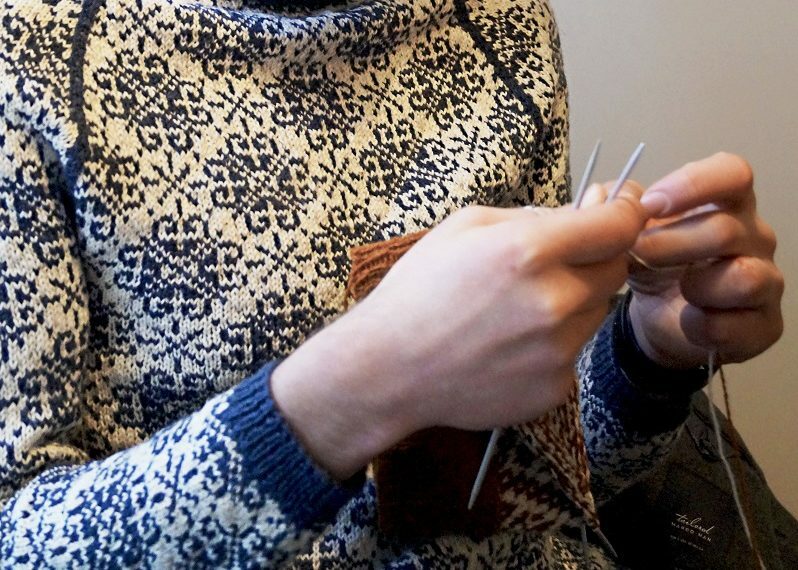 Even if Norwegians knit more in comparison with other countries – France for instance counts only 19% of women and 3% of men knitting according to a 2015 survey from IPSOS (a French research institute)– the gender gap is similar. Birger explains: It is still perceived as something feminine, but I usually try to remind people that is nothing female, it’s just cultural differences between men and women. In Norway, people should basically not be scared of doing something just because they are a man or a woman. I think a lot of men fear to be seen as women-like if they knit and that stops them from trying it. We should not forget that gender equality concerns both women and men. Birger’s activity is a good way to show that men and women can do the same things, and not only women can do the same things than men: If you talk about gender, it is often implied that it’s about women. We should have a holistic approach of equality. It’s important part of gender equality: everybody should do what they like and I think I live in a country where people are happy and satisfied because they can be themselves. Indeed, Scandinavian countries seem more open on the question. A recent example is the Finnish snowboarding coach at the 2018 Winter Olympics, Antti Koskinen, who knitted very naturally during the competition. Birger is also less nervous to knit in public spaces in Norway: It usually just attracts positive attention. Whereas in England, people have photographed me. I guess they found it exotic to see a man knitting or maybe just stupid. But you should not mind your surroundings. Birger was more bothered by people judgment when he was a teenager: In high school, you feel more pressure, and you want to fit in. But I never really felt fitted in. For my optional course, I chose to learn knitting in crochet. A lot of people made fun of that, they were sort of mean to me. I didn’t find very much welcomed among girls neither [in the knitting course]. I just had my own personality and it was kind of weird. I got a message from society very early that I was different, I was not completely right. When I got older, I realized I just wanted to be me and I ended up caring about what people think. If he never suffered so much from people’s opinion, it was mostly thanks to the strong support of his family: They always told me I will not be a wrong person whatever my hobby is and to do what I like. My dad has always been very supportive and proud of me. I think that’s a very good background to have. A Norwegian tradition… But not only! Birger can be inspired by everything, a color, architectures, a pattern: You can find inspiration everywhere because you can always relate your surroundings to your hobby. But his biggest inspiration remains the Sunnfjørd knitting tradition, his home region: I translate how I perceive colors and patterns from home in my own creations. It’s kind of bringing some of my family’s life in the city. In Norway, the traditional elaborated patterns and clothes have been popular for a long time and are still very fashionable. He noticed that traditional clothing and patterns were quite similar between men and women, in comparison to general clothing: women’s pieces are often a lot more decorated. This neutral style is nice for knitters who can find patterns suiting both men and women. Then, Birger travelled in Iceland and discovered another strong Nordic tradition, with its own patterns and special type of wool. Now, he would like to visit Faroe Islands: Knitting is a very Nordic thing I would say, so I’m glad to live in one of these countries! But the US has also very nice and famous yarn stores, and Southern America countries seem to have a colorful and beautiful tradition. Birger also went to Paris and was looking for a knitting store: I asked a woman if she knew a yarn store but she didn’t understand me. So I sort of mime knitting and she said “Ha tricot oui oui!” [“oh knitting yes yes!]. Since this moment, I use the hashtag #Tricot on Instagram, and maybe that’s why I got many French followers! Birger also got to know some foreign technics thanks to the Internet and met many other passionate people through the social media: Now we are able to see all the different ways to knit around the world! The coolest thing is when someone, maybe in another country, creates a piece from your own pattern and you discover her/his creation on the social media. Knitting is very international because people can understand it. And there is in fact a World Wide Knit in Public Day, ran since 2005 in many countries worldwide, and which should take place on June 9th this year. Birger is used to this event: In Bergen, people were sitting everywhere and knitting. But as it is very bad weather here, you would have more chance to meet them in the cafés! The event slogan, “Better living through stitching together”, reflects that knitting can also be a community activity for everybody: Some people think that knitting is something my grandma does. It’s good to do this in public cause it shows that everyone can knit: old and young people, men and women. Birger’s passion has inspired others: Now, during the lunch break, I see some of my colleagues who take knitting up again. Knitting, this activity reminding us our grannies in their armchair, is after all commonly appreciated in Norway. And as Birger showed us, it could even bind people together.